Wedding Cinematographer Jenny and Eddy Same Day Edit Video – Sweet and Romantic Wedding – Vancouver Wedding Videographer Life Studios Inc.
Life Studios Inc. was thrilled to capture Jenny’s and Eddy’s special day. That we were able to see another five of our past couples there was an awesome bonus! Jenny’s and Eddy’s grand, romantic wedding was held at the stunning Fairmont Pacific Rim on a beautiful summer day. Chinese bridal door games started the day and one of the tasks was so eat chocolate out of a diaper – we definitely did not envy Eddy and his groomsmen! A sweet and emotional tea ceremony followed the games and then it was time for the ceremony! The ceremony was held on the outdoor patio of the Fairmont Pacific Rim under a radiant, cloudless blue sky. “This is harder than I thought” Eddy says as he fights tears when he begins his vows. “Throughout the past four years you have supported me, picked me up when I was down, provided me with all the love that I could only dream of,” shares Eddy. “Today I will marry you, my best friend, the one I will live with, dream with and love forever….I can’t promise to fix all your problems but I can promise you won’t have to face them all alone,” vows Jenny. It was hard not to become tearful while watching these two exchange such touching words. The Fairmont Pacific Rim’s gorgeous ballroom hosted the reception and Eddy danced his way into the reception when making his and Jenny’s grand entrance. It was clear to see that he was so joyful that he couldn’t stop himself from dancing happily! Thank you for letting us be a part of your very special day Jenny and Eddy! 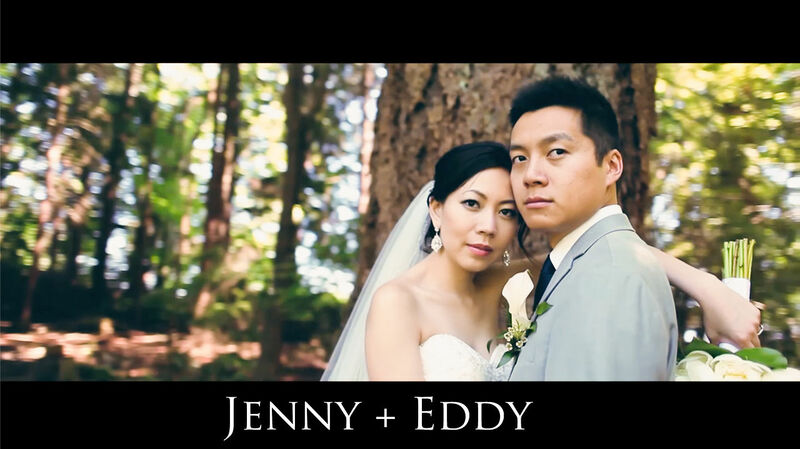 Be touched by watching the Wedding Cinematographer Jenny and Eddy Same Day Edit Video!